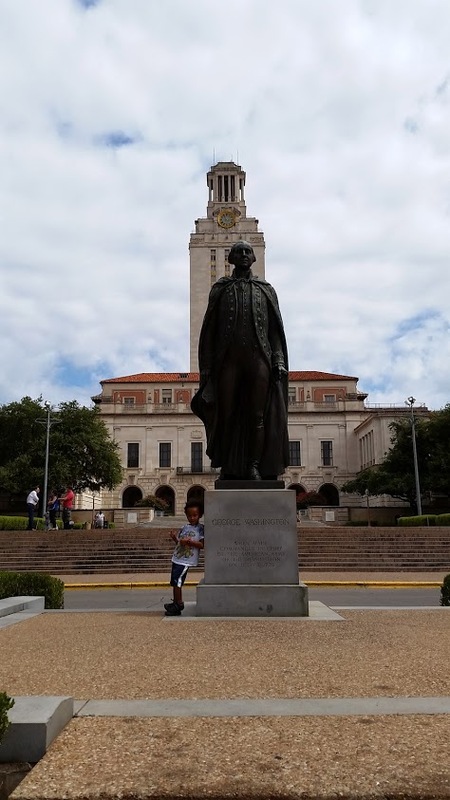 Posted by sunconnor in Austin Adventures, Coolin' and Homeschoolin' the kid! 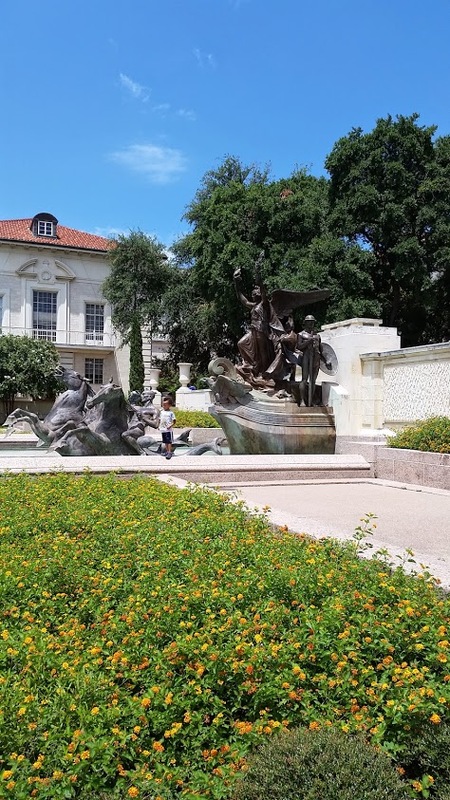 Today, the kid accompanied me to the University of Texas for a visit with an old friend who’s also a student there. For months, he’d inquired about UT as we’d often pass it walking or driving along the drag. So, I thought I’d plan a lunch date with “Ms. 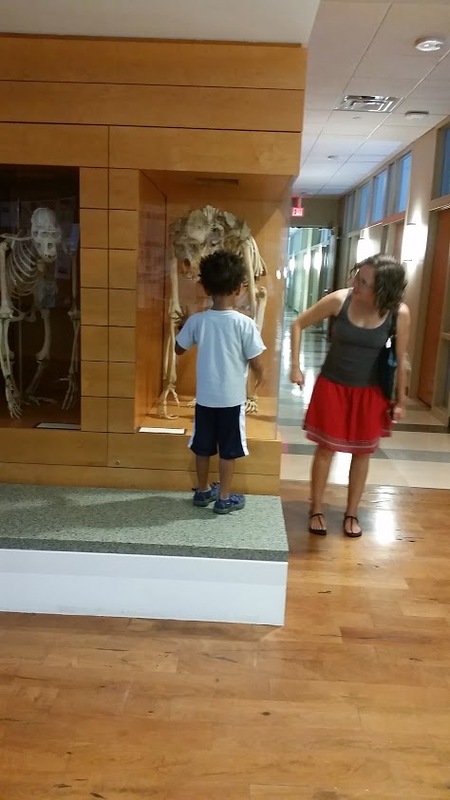 Nikki!” My son was filled with great excitement as this was his first time visiting the university. “WOW! It’s HUGE!” Is what he said. When we arrived, he noticed students with a boyfriend or girlfriend. He’d look up at me, frown and say, “YUCK!” Normal for a young boy, right? After lunch, “Ms. Nikki” took him on a brief tour of the campus – he was really thrilled to be there! 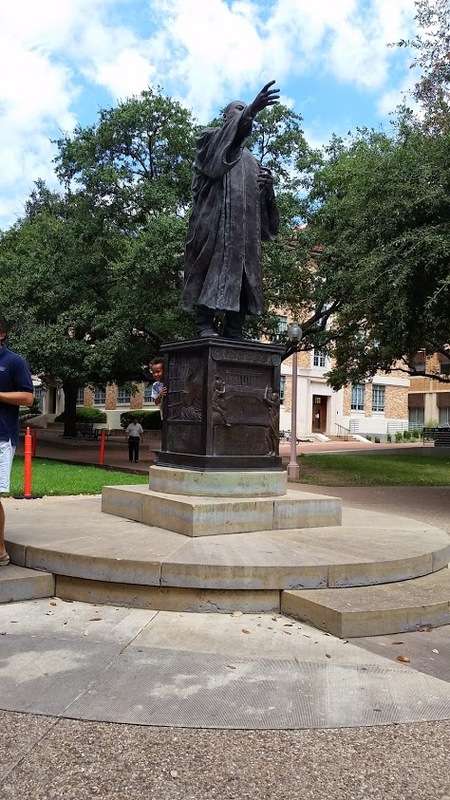 He later discovered the George Washington and Martin Luther King statues on Campus which was perfect, as we’d recently read about the American Revolution and Civil Rights. It was a great adventure for him to eat and hang around all of the “young adults” as he referred to them… He created his own play area -SLIDE INCLUDED- and the students passing by smiled and admired his high energy level and tenacity! I was totally amazed to see him comfortably interacting with UT students at such a young age! blah, blah, blah….not surprised one bit. This kid IS a social butterfly!. He was in a superb mood as he gallivanted around the UT campus exploring and chatting with students. His face and this moment brought up a pleasant smile within me. The kid had a great day and the world is HIS playground! I’ve been so tangled up in work that I love to spend my free time with my kiddo. We recently decided to go out on a day trip around Austin and ended up in the Hot Lava obstacle course/ training ground. 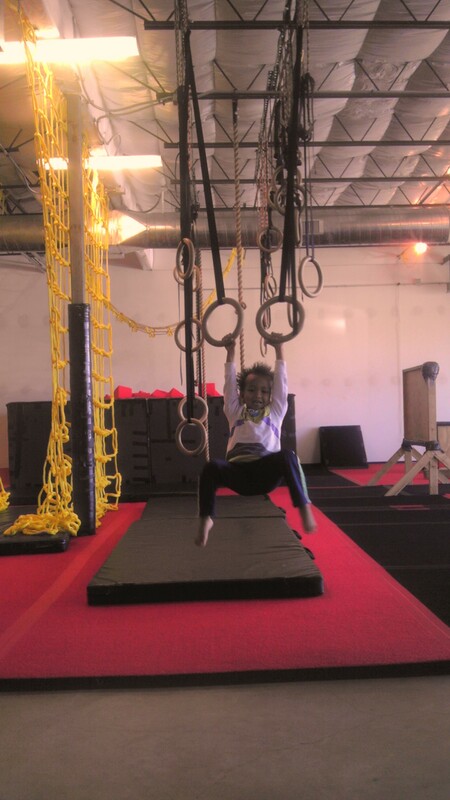 A colleague of mine recently mentioned we should take the kid because of his recent American Ninja warrior aspirations. And, wow! It was the most fun day we’d had all week. I have never been to a parkour gym and so no wonder I was quite skeptic about it but I am glad that we made the decision to try it out. It was entertaining, challenging and most importantly it was full of fun. The gym was all about pushing your limits to take up the challenge and win it. 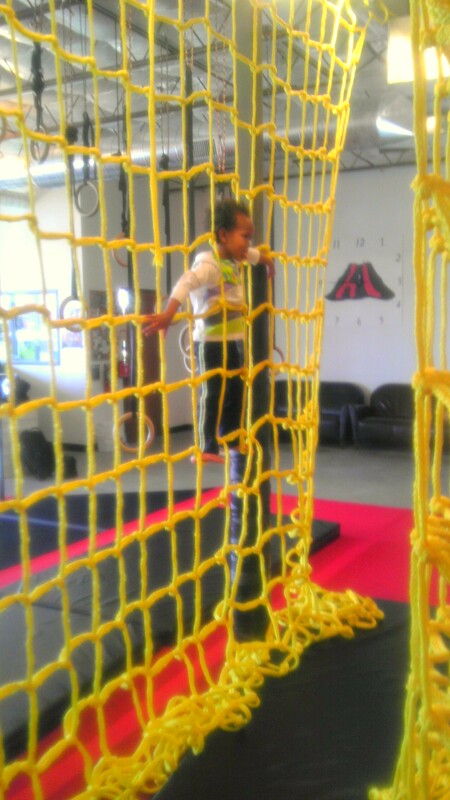 We had to involved in jumping, running, crawling, and climbing to get pass the obstacles. Yes, it was indeed very tiring but it was also simply awesome. 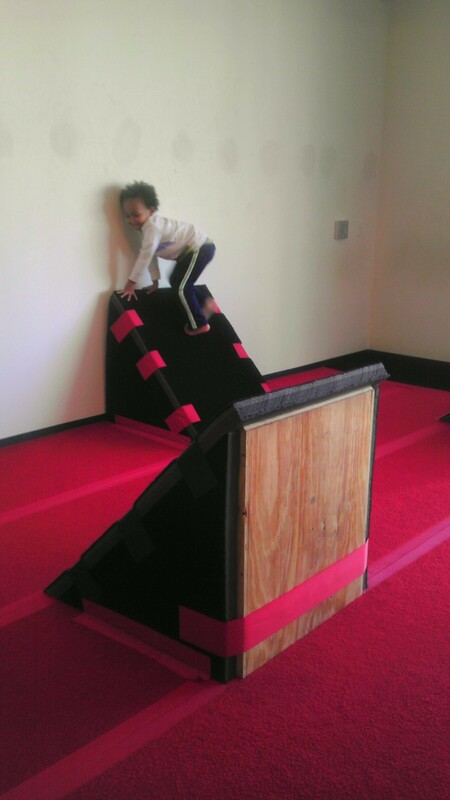 Unlike, the usual children’s bouncy houses we frequent – Hot Lava’s all about creating a strategy and way to get over the obstacles and reach the destined place. When in Hot Lava it felt like being in a playground again only that the size of the playground was now giant. It is a limitless exploration of the surrounding environment which is bound by stimulated excitements and it did bring out that little child in me which I thought was long gone. I felt that Hot Lava was great exercise for the kid except the difference is that he enjoyed doing it. And, we are definitely going back again; it is a perfect way to channel energy to a fun activity. Note: Children under 8 are only allowed between 10am and 2pm. Coolin' and Homeschoolin' the kid!